I’ve not managed to grow many flowers this year on the allotment. My ambitions for great armfuls of dahlias were ruined by the slugs that have had a wonderful time working their way through my plants, and the sweet peas haven’t fared much better. Thankfully, I do still have enough to bring home. The great thing about sweet peas in particular is that the more you pick them, the more flowers you get, as the plant continues to try and produce seeds. You might remember, a while ago, I decided to try and sort out my bedroom and make it a tranquil, child-free space. Well, that didn’t go exactly to plan. The stacks of books are still there, the laundry regularly overflows and the yin and yang of cycling (aka my Pashley Princess Sovereign and my husband’s Specialized road bike) are currently propped up at the end of the room. So, despite my beautiful grey walls (Farrow and Ball’s French Grey, which I love) and white bed-linen, it’s not that haven of tranquility I imagined. I’m not giving up though. 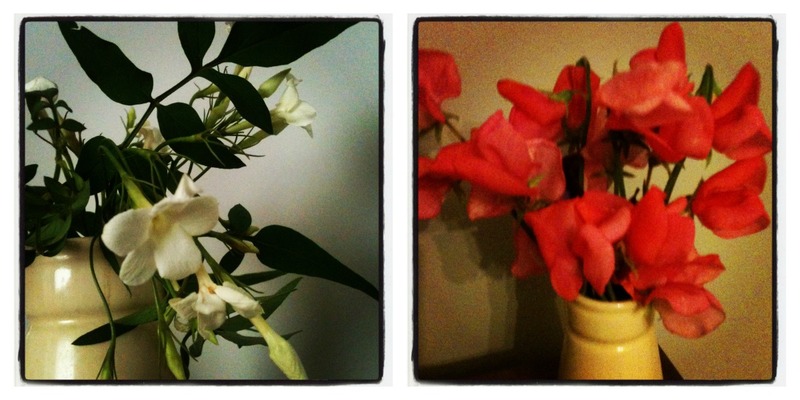 One of the ways to bring a little beauty into the chaos is by adding flowers to my bedside table. That way, when I wake up, the first thing I see are beautiful flowers and I can imagine for a split second that I’m the kind of person with a bedroom worth featuring in a design magazine. Then reality kicks in, obviously. And that’s if I haven’t been woken up by my three year old son launching himself, elbows first, onto my bed anyway, which is how I’m usually catapulted into each morning! Thankfully, given my lack of abundance on the cutting patch, a small bedside posy of flowers doesn’t need to be huge to have impact. The other thing that flowers bring to the room is scent. Even a small handful of jasmine can provide the rich heady fragrance that the flower is famous for, and it’s a wonderful thing to go to sleep with that fragrance swirling around you. In a larger room, the amount of flowers I usually use would get completely lost (especially given my clutter creating tendencies) but by the bed, they’re perfect. I’m really inspired by Sarah Raven who creates beautiful and heavily productive gardens, with the aim of cutting flowers for the house. In these photos, I’m using a small Emma Bridgewater bottle. I also love to use an empty bottle from REN Rose Otto bath oil, which is little and has a narrow neck, perfect for more delicate flowers and my mum just gave me a vintage half pint milk bottle from Cowes (no pun intended) which will also be put to the same use. Having flowers in the house is a gentle reminder to me of my ambition to study horticulture, so I can be more successful at growing flowers in the future. For the time being, these little posies bring me a little bit of joy every day. 3 Responses to A posy by the bedside. This is lovely and sweet peas are another memory trigger…I remember buying them at roadside stalls on bike rides when I was young and they always seemed such happy yet delicate flowers – I still love that soft blue violet colouring.